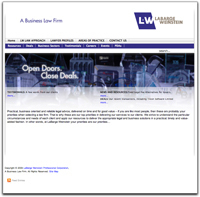 Labarge Weinstein is a Business Law firm based in Ottawa, with a focus on Ottawa's high tech industry. As part of a brand update, the firm wanted to make sure that their web site was delivering a consistent message, and portrayed the forward thinking direction of Labarge Weinstein. RKIL partnered with Deep Partners to develop a site that would allow LWLaw to create a site that could be maintained by staff. Deep Partners provided the Marketing and graphical design expertise, and RKIL provided the technical design and development. The server was based on a Joomla server running in the Labarge Weinstein office, and provides a web based interface to allow staff members to update the sites' content.